I’m going to make a rather large statement here. Small, my friends, is better than big. There is a tipping point in almost all aspects of life where big becomes too much, too unmanageable, unfeasible. Do you know that feeling after a big meal? Not nice, walking around with stones in your stomach for hours. Your body will thank you for sticking to smaller, sensible portions. And if there is a large spread, small portions mean you can sample more flavours. Small food is fun, neat, grown-up in a good way and can be eaten with your fingers. Small food is almost too good to be true! 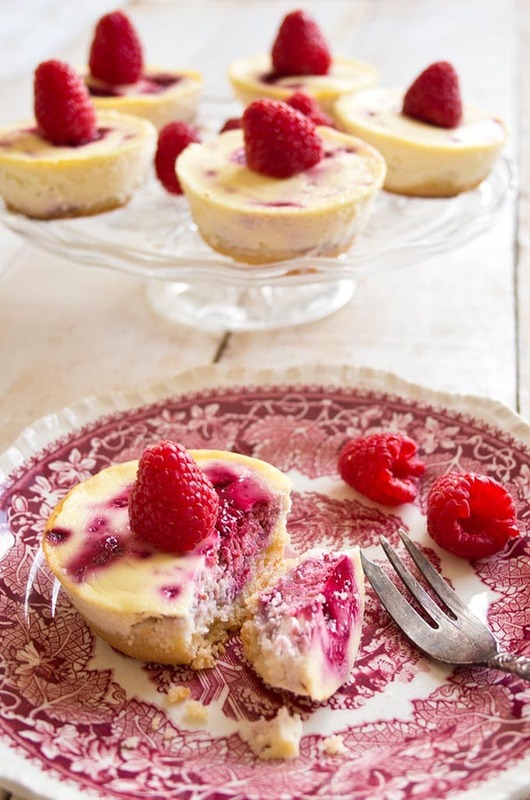 Here’s the epitome of a perfectly formed small dessert: low carb raspberry cheesecake. You all know I’m a big (oh dear – wrong word?!) fan of muffins. 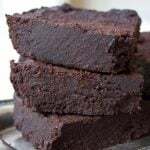 I’ve posted recipes for spinach & chive mini quiches, carrot cake muffins, low carb chocolate banana muffins, chocolate feast muffins and my most popular recipe, grab & go low carb muffins. I think they are the perfect size treat. After making this (full sized) orange brandy cheesecake recently, I thought it was time to test my beloved silicone muffin pan with some mini raspberry cheesecakes. These supremely tasty, super-fruity cheesecakes are so easy to make, you could basically do it with your eyes closed. I made a raspberry sauce with the very useful low carb thickener xanthan gum, inspired by Step Away from the Carb’s Low Carb Berry Sauce. If you are in a hurry, you could even skip this step and drop a few whole berries into the cheesecake mix instead. 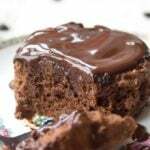 The one thing I do recommend is to use a silicone baking mould (pan). Unless you use paper cups, a silicone mould is the difference between getting your muffins or mini raspberry cheesecakes out in one piece or scraping tasty crumbs onto a plate. Raspberries are one of my favourite low carb fruits. They have 7.3 net carbs per half cup. 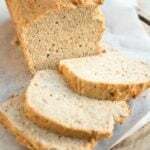 The blog All Natural Ideas has an interesting article about the best low carb fruits – check it out here. 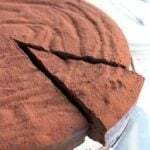 You can, of course, make this recipe as a cake (increase the oven time in this case to 1 hour and use a springform). Because as we all know, exceptions prove the rule and when it comes to cheesecake, big can be (almost) as good as small. 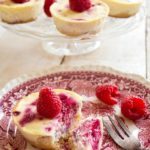 These creamy, fruity individual mini raspberry cheesecakes are a perfectly guilt free low carb indulgence. Heat the oven to 160 Celsius. Mix the ground almonds and coconut flour with 1 tbsp Natvia, 1 tsp vanilla extract and the softened butter until you have a ball of dough. Set aside. 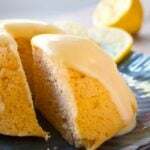 Mix the cream cheese with the eggs, the remaining 4 tbsp of sweetener and the other 1 tsp of vanilla essence. Now you assemble the mini cakes: Form small disks in your hands and press them firmly into the bottom of the muffin tin. 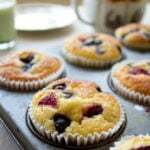 If using a regular muffin tin, don't forget to grease the moulds well and perhaps even line the bottoms of the tin with circles of baking paper. I recommend using a silicone muffin tin - this way you are guaranteed to get your cheesecakes out in one piece. Next, spoon the raspberry sauce on the dough base and then pour in the cheesecake mix. Stir a little to get some of the sauce to the top, but be careful not to over-stir. It will still taste great, but not look as pretty. Dot any remnants of the raspberry sauce on the top. Bake ca 45 minutes until the top of the cakes is firm. The center will still be jiggly. Cool to room temperature, then put the muffin tin in the fridge and wait until the cakes are cold. Only then remove them from the mould. Hi I’m guessing these would freeze ok too? 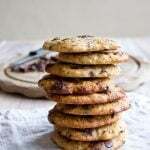 Can I use almond flour instead of the almonds? 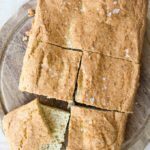 Lots of people have given this recipe 5 stars but it’s not clear from their comments if they actually made it first. I thought it was great but there are a few changes I’ll make next time. The base didn’t come together as a dough so I added more butter and it was ok when I pressed it into the moulds. I had enough base to make at least 16 cheesecakes but only enough cheesecake mixture for 12, so I’m thinking of trying 75g almond meal, 40g coconut flour and 50g butter for the base next time. I also found that they only took 30-35 minutes to cook in my oven but it’s a terrible old oven that often seems hotter than it’s supposed to be. I’ll definitely be making these again! 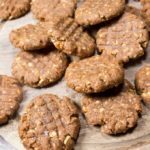 What is the carb count for these delicious looking treats? YUM! Raspberry cheesecake is my favourite!! I love that these are bite sized pieces. 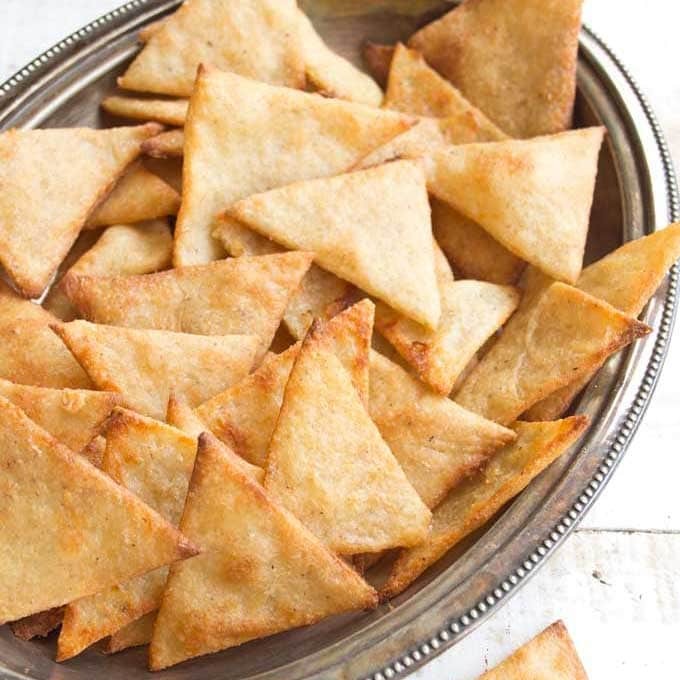 I’m going to a pot luck dinner this weekend and these would be a perfect dessert to bring. What a great idea. Hope you’ll make them! Let me know how you get on Bintu! 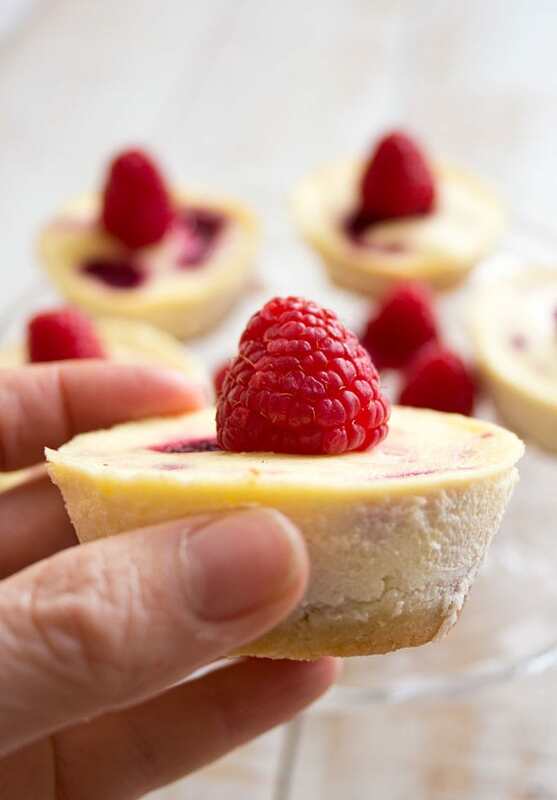 Love these bite sized cheesecakes, perfect for people who need a gluten free sweet treat. This makes for such a lovely little treat! These look perfect! I love mini desserts, they’re so fun! These look amazing! bite size cheesecakes, love it! Glad you like the look of them! Now you have me craving cheesecake in the morning, thanks alot hehe. Raspberry is a great twist on the traditional strawberry cheesecake too! Yum!!! 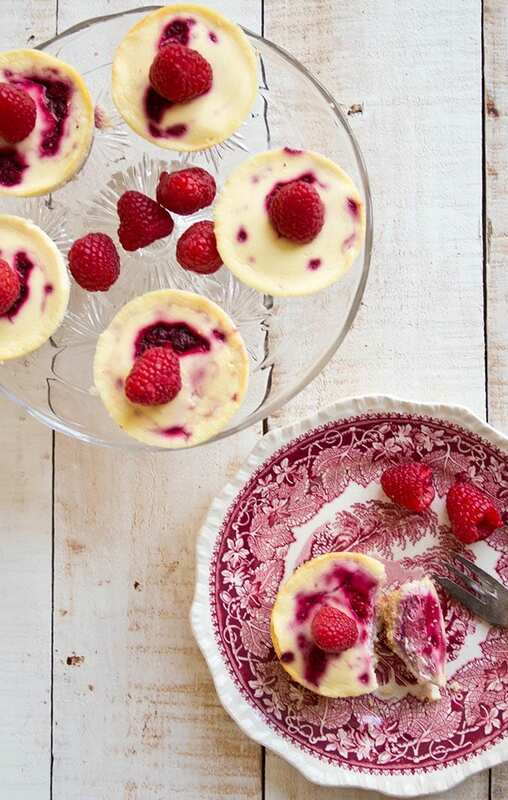 Those raspberries look PERFECT! I haven’t made cheesecake in forever and I love mini desserts! Once you start making cheesecakes…. 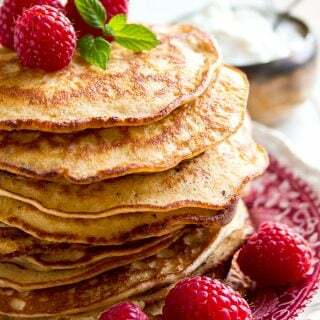 you want to make them every week!